This easy trail features many wonders to inspire your kids, from blue holes (plunge pools) to mudpots, to rockhouses and mine relics. Hiking on the Cumberland Trail in the North Chickamauga Gorge provides something for everyone, from family picnic areas along the rushing creek to rocky, strenuous trails leading to incredible views. From the parking lot, the trail begins as a jeep road alongside the creek, with picnic tables and blue holes for swimming. In less than half a mile you'll pass a trail coming down on the right; this is the Hog Skin Trail, which provides the quickest and easiest route to the upper gorge. If you'd like to make a loop and are up for a rocky, challenging trail, stay on the jeep road but bear right when it is about to cross the creek. Both trails connect to an old mining road that climbs steadily towards the bluffs. You'll pass an old coal tipple, then find yourself at the base of towering cliffs with the gorge below. Just beyond is an old mine (not safe to enter) where you can get a good view of the gorge.If you choose to continue, the climbing isn't over as the trail bobs and dips to follow the bluffs, but in less than mile you'll climb a wooden staircase to Boston Branch Overloop, the best view of the Gorge. Most day hikers turn around here. The trail, rough in places but passable for the determined, continues another six miles. 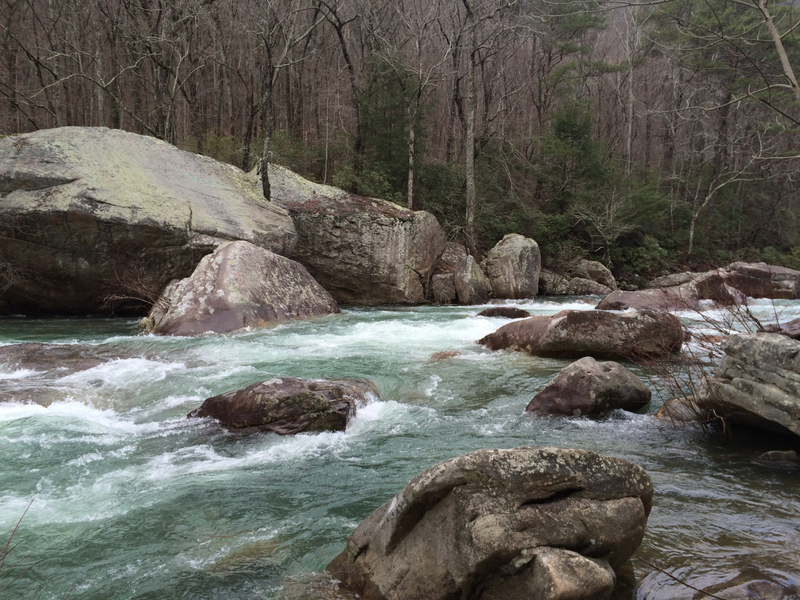 Stevenson Branch Falls, at mile 4, provides a spectacular backcountry camp (permit required for overnight stay). The trail ends after 8.3 miles that two includes at least two creek crossings. The first half mile of trail along the creek is a favorite with families and kids for picnics and explorations of the creek. Climbing up the mining road to the bluff and its amazing views is more strenuous but worth the trip for conditioned hikers. Seasoned trail runners can eat some of these miles but will need to slow for some of the many technical and/or steep sections. The entrance to the trailhead is on the left as you begin to climb the mountain on Montlake Road, about 1.2 miles from Dayton Pike. Be sure to be back by dark or you risk having your car locked inside the gate (overnight parking is by permit).